A young mouse forms an unlikely friendship with a large bear. 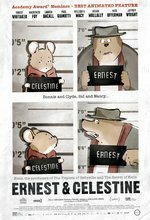 In an anthropomorphic animal-populated world where bears live in comfort above ground and their sworn enemies, mice, live in squalor in the sewers, bear busker Ernest forms an unlikely friendship with young mouse Celestine. The connection unites the pair at the cost of making them pariahs in their respective societies; they must ultimately work to evade authorities bent on apprehending them for fraternizing with "the enemy". Nominated for an Academy Award for Best Animated Feature.